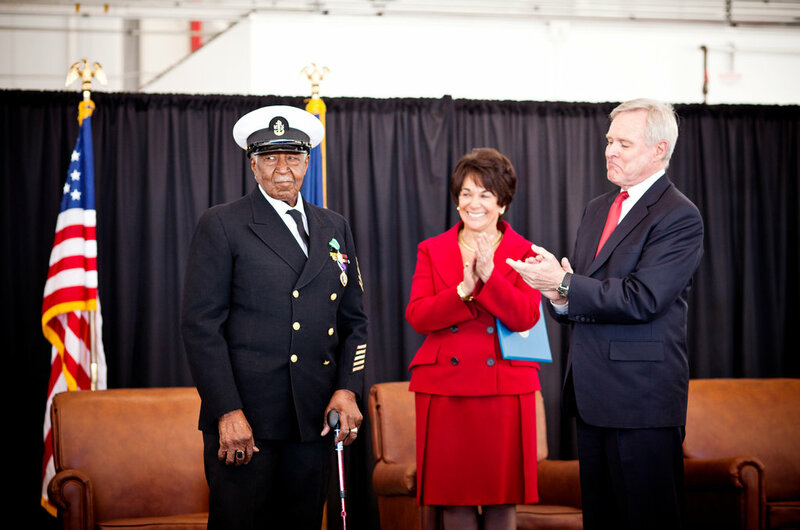 Carl E. Clark, 99, stood before a cheering crowd of 600 on Tuesday at Moffett Federal Airfield in Mountain View to receive a combat medal for bravery in World War II, an honor he was originally denied because he’s black.“This has been a very, very long day coming — 70 years plus,” said Representative Anna G. Eshoo, a Democrat who is Mr. Clark’s congresswoman. “Racism robbed Carl of recognition.”“I’m so overwhelmed,” said Mr. Clark, who wore his old uniform, only slightly tailored to fit again after so many years.Ray Mabus, the secretary of the Navy, flew in to bestow the honor, the Navy and Marine Corps Commendation Medal with the Combat Distinguishing Device. “Simply put, Carl Clark was and is a hero!”said Mr. Mabus.